Ever tried dishing out a mushroom recipe? I have discovered a fabulous culinary substitute for high calorie meat - mushrooms! Mushrooms such as Cremini, (otherwise known as the Brown Mushroom, Brown cap, Chestnut, Champignon Marron), Portabello (large Cremni, which is by far my most favourite variety of exotic mushroom), and Trumpet Royale Mushroom and Eryngii Mushroom or King Oyster Mushroom have a heavy texture and a savoury bite that is as flavoursome as meat. For meat lovers who are struggling to give up high-energy density meat in the diet, or people who are deliberating to move toward vegetarian alternatives, a low-carbohydrate mushroom recipe is definitely something worth trying. Mushrooms are low in calories (1 full cup contains only about 45 calories), low in sodium, have virtually zero fat and cholesterol. No wonder why they complement so many meat dishes and why some even consider them as the meat-eaters vegetarian choice. Thinking about it, perhaps that's why the vegetarian diet consists large quantities of mushrooms. 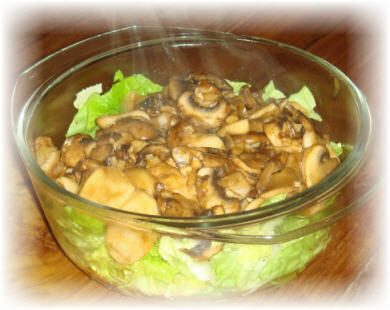 Not only healthier, mushrooms are also as palatable and satiable as meat, making you feel full and gratified. I believe this mushroom-eating strategy can be helpful in shedding pounds and promoting weight loss. Furthermore, mushrooms are also rich in natural glutamates, contain a host of amino acids, and have an excellent source of vitamins B and D, a nutrient very much associated with prevention against osteoporosis and colon cancer. 1. To prepare fresh mushrooms, first trim off any hard bottom on the stems and knock off any sticky bits of dirt with a damp kitchen towel. Then give them a quick wash under the tap, they don't really absorb as much water and turn mushy as what many people had warned. 2. Fry chopped garlic in oil till it's slightly brown. 3. Add mushrooms and continue to stir-fry until they become soft. 4. Turn off heat and add salt and pepper. 5. Cut lettuce into thin strips. If you are looking at a low fat, low calorie alternative to bacon, you must see this! Crisp Mushroom! I have personally tried it, but it didn't work out very well. I'm not sure where went wrong, but the mushrooms tasted somewhat bitter. Perhaps overbaked? End of "Healthy Mushroom Recipe" Back to "Honey Recipes"